The Mercian Regiment has marked its tenth anniversary with a parade through Worcester. Soldiers from the unit, known as "The Heart of England's Infantry", come from five counties, once the ancient kingdom of Mercia. Hundreds of spectators lined the parade route, which began at the city's cathedral. 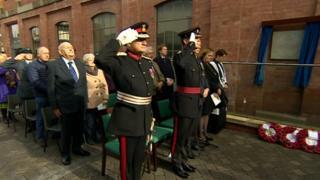 A plaque dedicated to Private Fred Dancox, 100 years after he was awarded the Victoria Cross, was also unveiled. Private Dancox of the fourth Batallion the Worcestershire Regiment fought in the Battle of Poelcappelle where he dodged machine gun fire to enter an enemy bunker armed with grenades. He emerged with 40 prisoners and holding a German machine gun. His grandson, and namesake, Fred Dancox said: "It's a wonderful thing he did". "It deserves a great deal," he said, "and they [the Regiment] have given a great deal." Soldiers marched to Dancox House Army Reserve Centre on Pheasant Street, where the plaque was unveiled. Recruits to the Mercian Regiment are drawn from Staffordshire, Worcestershire, Derbyshire, Nottinghamshire and Cheshire as well as the Black Country and the Wirral. Earlier celebrations of the regiment's tenth anniversary were tainted by the death of its mascot ram, the 31st Private Derby, the day before a parade in Tamworth.